Recumbent bikes offer excellent, low-impact exercise that’s well-suited for anyone who’s just embarking on a workout regimen, dealing with lower-back issues, or starting on the long road to injury recovery. Other stationary bikes are associated with intense, breathless workouts, and while they may get you to your fitness goals faster, they also put more strain on your body. Recumbent bikes take the load off your back and joints, with a full bucket seat and forward-positioned pedals. We turned to experts to help us find the essential elements of an ergonomic and challenging ride. Physical therapist Mitch Owens underlined comfort and convenience as two of recumbent bikes’ best features: “You get upper back support from the chair and they’re easy to get on and off of. Both are great for mobility issues.” Physical trainer Drew Logan echoed this sentiment, noting that “Recumbent is good for low back or load-bearing issues. Other [upright] styles may make injuries express themselves, but on a recumbent, [your] feet are in front of you.” This allows you to pedal without putting pressure on knees. 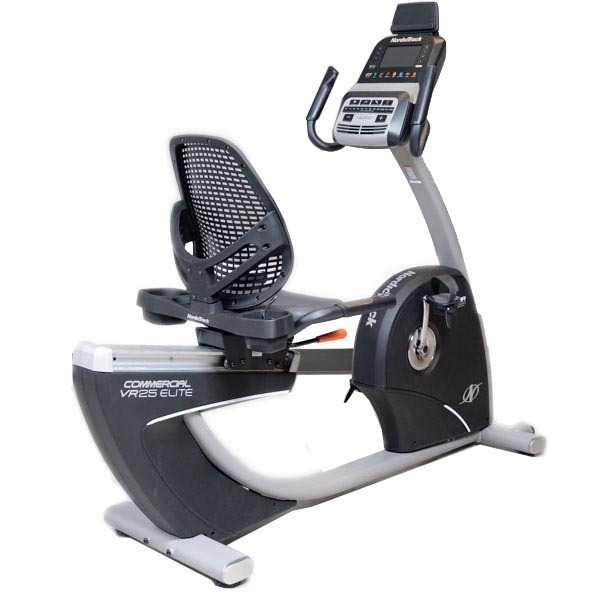 In addition to exceptional comfort, recumbents also tend to have more detailed consoles than other exercise bikes. Spin bikes, for example, support intense training, but are pretty unyielding and low-tech. A recumbent bike may not give you the toughest cycling workout, but its superior comfort and rich programming could prove more motivating for users who prefer more direction. We set out to find the recumbent bikes packaging these qualities best. We started by gathering data on all recumbents made by Bladez, Diamondback, Nautilus, NordicTrack, ProForm, and Schwinn — top exercise-bike producers with a foot in the recumbent market. Then we ran them past a set of standards informed by our own research and the experts we consulted. Powerful resistance – Recumbent resistance derives from electromagnets shifting toward and away from a metal flywheel. Pedaling against too little resistance can be jerky, analogous to pedaling your bike while coasting down hill. Substantial weight improves ride feel by absorbing energy output. State-of-the-art recumbents have flywheels weighing in at around 30 pounds, while dinky, poorly rated models hover in the low teens. To ensure smooth, even pedaling, we required the flywheel to weigh at least 20 pounds. Diverse workouts – Leaning back and pedaling is not the most exciting activity, but we think a low-impact workout should still be invigorating. In the interest of keeping us engaged and motivated, we looked for bikes offering a wealth of programming and a wide range of intensities — at least 20 preloaded workouts and 15 levels of resistance. Durable and low-maintenance – Exercise equipment needs a lot of intricate parts to create enjoyable, ergonomic motion. These components are easy to overtax with intense use, and the fix typically isn’t straightforward. As a guarantee against the headache of flawed machinery, we wanted to see a substantial parts warranty. Recumbent bike warranties are longer than that of other styles (as many as five years, while spin bikes typically cap off at three), so we drew a line at two years, minimum. We found 6 bikes that met our criteria, and brought those in for testing. The six recumbent bikes we ultimately brought in claim a number of essential features: convenient adjustability, heavy flywheel, lots of programming, built-in heart rate monitors. To find the best of the best, we needed to take them each for a spin. We worked out on them all, grading ride feel, programming, and comfort, in that order. A great ride experience encompasses ease and difficulty. Once you have your bike perfectly adjusted, you’ve keyed in your stats and started your workout, how does it feel to ride? We wanted dense, smooth resistance — something that absorbed our effort, letting us exert force without bouncing around in our seats. A wide selection of intensities, ranging from lightweight pedaling to stomping through concrete, allows you to start working out at your current fitness level while giving you lots of room for growth. We wanted a bike that would be hard to outpace. The NordicTracks and ProForm took the lead, but we were also impressed with the Diamondback 910Sr. One tester described the ride feel of all four bikes as “luxurious” — heavy, consistent, profoundly smooth. Their upper resistance levels were also the most challenging. NordicTrack VR25 and ProForm 740 scored highest for range of intensity: The top levels felt like trying to kick over a stubborn horse. While every pedal had the momentum of a weighted lunge at this point, we found we were able to maintain rhythmic motion. Our two favorites: The ProForm 740 (L) and the NordicTrack VR25 (R). Both the Nautilus R616 and the Schwinn 270 can reach satisfyingly intense levels, but start to lose the sensation of cycling in the process. When we tested out their top levels we felt like we were climbing stairs. And staying seated while climbing stairs is just as tricky as you’d imagine: We kept slipping down into a slouch as we tried to punch one foot forward at a time. No matter the resistance level, cheaper bikes tend to ease up intensity at the crest of each rotation, resulting in uneven, staccato-like pedaling. We have a theory why: While both Nautilus and Schwinn boast exceptionally heavy flywheels (30 pounds each) they’re the lightest machines overall, which reveals that their other components may not be of equal quality. Heavier bikes, regardless of flywheel weight, do a better job at maintaining constant resistance around the axis and kept us squarely in our seats. Another detail in overall ride experience — noise. A great, at-home exercise machine keeps it down, so you can watch TV at a normal volume, or just work out without making enemies of your neighbors. We found that most of the bikes were pretty quiet, emitting either a muffled hum or nothing at all. The electrical braking system (ECB) in recumbent bikes should be practically silent, though sometimes the rotating flywheel and churning belt make some racket of their own. The NordicTrack VR25 was the worst of the best. It sounds like a tiny airplane endlessly taxiing around the tarmac. The ProForm 740, by contrast, creates a whisper-quiet mechanical whir. Programming quality boils down to the breadth and usability of its features, plus the clarity and responsiveness of the controls. We compared each bike’s fitness programs and health metrics, and counted how many times we had to press a button in order to level up or change programs. Easy-to-read screens that keep it simple, scored high. Pixelated or dark screens, convoluted option trees, and loud beeps did not. We found the fully-loaded, intuitive consoles of NordicTrack and ProForm assisted in our getting a more satisfying and informed workout. Both are owned by ICON Fitness and come equipped with ICON’s first-in-class fitness technology, iFit. You have to buy a monthly subscription to unlock iFit’s full potential — scenic videos, trainer-guided workouts, and so forth — but even without the subscription, the clarity and sophistication of their touchscreens and basic programming is stellar. Especially compared to the outdated, blinking bar charts of Diamondback, Nautilus, and Schwinn. We loved the bright, clean visuals on the ProForm console. Where there’s a family resemblance, there’s probably a parent company. NordicTrack and ProForm are structurally and technologically identical, which puzzled us till we discovered that they’re owned by the same company. Same goes for Nautilus and Schwinn (Nautilus, Inc.). But a shared origin doesn’t necessarily equal shared traits. We noted striking differences within both litters. Still, touchscreens can be vexing when you have to repeatedly tap to get a response. We found that the bizarrely high placement of the NordicTrack VR25’s screen made precise taps difficult for users under 6 feet, but the screens on the VR21 and the ProForm were refreshingly responsive. And the non-touchscreen controls (numbered resistance levels and program categories like “Calorie Workouts”) were also snappy responders. All told, the usability — and performance feedback — of the iFit-equipped models soared above the rest. All recumbent bikes offer basic feedback, but the delivery of that information is not equal. One of the biggest indicators of a console’s use-value: how it depicts heart rate. The ProForm and NordicTracks provide a numerical heart rate reading that pops up in a small window when you ask for it, and then disappears. The Schwinn and Nautilus utilize a large, always-present bar chart that indicates your heart rate zone (Warm-up, Fat Burn, Aerobic, Anaerobic) based on percentage of max heart rate, no exact number at all. Diamondback improves this design by uniting both heart rate methods to show an exact number plus its location within a percentage graph, but we still aren’t crazy about the clunky design. Heart rate sensors aren’t very accurate.It’s a convenient way to gauge your intensity, but none of these heart rate handles work especially well. But this downside isn’t unique to recumbent bikes — we’ve found the same goes for all the equipment we’ve tested. Perhaps our biggest programming surprise was how noisy the consoles were. The Schwinn 270, Nautilus R616, and Diamondback 910Sr all made shrieking beeps when we turned them on and after we pushed just about any button. Schwinn and Nautilus also continued to beep when we weren’t pushing anything at all. (Was it because we claimed another .10 miles? Because we burned more than 13 calories?) The only thing worse than a yappy display is a yappy display without volume control. While the ProForm 740 also defaulted to loud beeps, its volume buttons are easy to find and put to use. For the others, noise-cancelling headphones are the only answer. To quantify comfort, we checked adjustability, seat and pedal design, and how easily we could reach everything while seated. 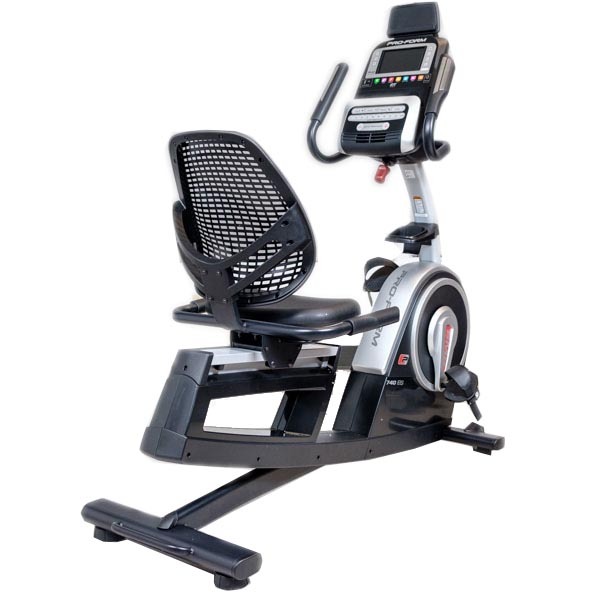 The ideal recumbent bike has a comfortable, supportive seat and back, with curves that cradle your posture but don’t confine your movement. The seat needs some traction — a textured surface to guard against sliding around while pedaling. It also allows for easy adjustments, sliding to the perfect length without needing to be coaxed or threatened. You shouldn’t have to work up a sweat before you work up a sweat. The two NordicTracks and the ProForm 740 scored highest overall for comfort. They boast a lot of luxury components, and we felt their superior design the second we sat down. We loved the latticed rubber seat backs and cushioned seats, which kept us in place even as we pumped through max resistance. Plus, all three bikes make calibrating to the perfect leg length easy. You glide between settings. Adjustability is non-negotiable.Recumbent bikes don’t boast the same four-way adjustability of other bike styles, typically limiting customization to leg length. Make the most of it by positioning legs at a declining angle from hips with knees 10-15 degree bent when fully extended. NordicTrack VR21 and ProForm 740 lost a little of our admiration by placing heart rate sensors by the console, rather than the seat. We weren’t crazy about the necessity of leaning forward to grasp those, or reach the water bottle holder on the console stem. NordicTrack VR25 solved both of those issues by placing amenities at hip height. In terms of both comfort and adjustability, we were a little disappointed in the Schwinn 270 and Nautilus R616. Their hard plastic seats don’t exhibit the flexibility or breathability we admired in NordicTrack and ProForm. And in terms of adjustability, they gave us a wild ride. After loosening the adjustment knob, the seat seesaws from side to side while sliding downhill. If you have ever been unfortunate enough to try adjusting the front seat in a car while braking, you’ll know the sudden crunch we experienced. Then, if you try to push the seat back with your feet on the ground, you slide the entire machine back. Those inconveniences put big dings in their score, but both do boast handy, seat-side water bottle holders and heart rate sensors. The Diamondback 910Sr got it half right — nearby heart rate sensors, a distant bottle holder — but gave us grief by making adjustments nearly impossible. We had to call our assembly person back in to manhandle it to functionality. After that, we were able to adjust, but found you really have to recruit your gluteus maximus to get it to budge. Still, Diamondback’s seat was incredibly comfortable. Its swayed netting filled in all the spine curvatures that other seats didn’t. Apart from seat and slide, reaching the console is a biggie. The surprise worst offender here was the otherwise beautifully made NordicTrack VR25. Its console sits high atop a non-adjustable stem and tilts toward the ceiling. If you’re under six feet, you have to squint against glare just to see the screen. Its little brother VR21 as well as the ProForm 740 resolve this issue with a twisting knob that pulls the console to your ideal angle, accommodating short and tall users alike. Our favorite bikes scored high in all three categories and give you a lot for your money. All in all, we found price to be pretty indicative of quality in the recumbent market. When deciding which bikes to recommend, we looked at testing results as well as the features you get for the cost. For instance, The ProForm 740 and the NordicTrack VR21 are the same price and super similar, but the ProForm boasts the same 7 inch touchscreen as the mightier VR25, an upgrade that bolstered its first-place rank. NordicTrack VR25 and ProForm 740 scored the highest overall, and cost about twice as much as the Nautilus R616 and Schwinn 270. We felt the ride experience was actually twice as good, rationalizing the price jump. But if $800+ isn’t a reasonable purchase for you, know that we only brought in quality bikes — even the lower-scoring models will still be a good purchase. The one outlier to the price/quality rule — the expensive Diamondback 910Sr (at $999, it costs the same as the sophisticated NordicTrack VR25). It scored well on ride feel and comfort, our first and third priorities, but the old-school technology it offered for such a steep price dragged down its overall marks. All the best features in one package: even resistance, total adjustability, superior ergonomics. Large enough for an open feel, but small enough to lift onto its front wheels and transport with ease, ProForm’s flagship recumbent model is a happy medium in every way. But it really won us over with unexpected upgrades, like the adjustable console and the truly superior tech — the same deluxe setup you’ll find on the NordicTrack VR25 but for a couple hundred dollars less. Even on basic screens (i.e., when we weren’t virtually cycling Hawaiian highways) we enjoyed the glossy iFit layout, which organizes all available info legibly and gives clear indicators of where you can customize (changing measurements for distance, for example, with a quick swipe). We admired the wide range of metrics, as well as how intuitive they were to access. Throughout our testing, it was hard not to repeatedly compare NordicTrack and ProForm head-to-head, particularly on ride feel. Both offer reliably smooth, mellow resistance, but ultimately we pegged the ProForm as the slightly more comfortable. When we moved from high to low intensity, the NordicTrack felt like it was shuddering to a stop, while the ProForm continued to exert controlled pressure. That exceptional ride feel also benefited from a molded, flexible plastic seat back that moves with you, keeping your back cradled as your body naturally twists side to side. We felt secure from first adjustment to dismount with the ProForm. A far cry from the sudden slide of the cheaper models, adjusting on the ProForm takes place on your time. Even after you release the lever, the seat won’t move until you apply some torque, either with feet on the floor, against the pedals, or just pushing away from the console handles. One of the few issues we had with the ProForm 740, we also had with every single other recumbent we tested. The foot straps are set to cover the foot diagonally, from the inside ball mount of the foot to the outside arch. We found that no matter how tightly we tried to strap our feet in, they slide into a turned-out position — not a great stance for parallel pedaling. Other than that, the ProForm 740 assisted us in achieving an effective, ergonomic workout in every way possible. This bike makes it blissfully easy to find your perfect position and get a great workout. Essentially the same, well-designed bike with a couple additional convenience perks for a higher price. An exceptionally spacious design, the NordicTrack VR25 will appeal to taller users, or users who prefer to have more room between them and the console. In terms of technology and overall experience, our two top picks are twins. And nearly every compliment we had for the ProForm holds true for the NordicTrack: Exceptional tech, good ergonomics, and thoughtful amenity placement (with one exception, covered below). We especially liked that NordicTrack VR25’s seat handles feature not only heart sensors but also arrow buttons to adjust resistance. This stand-out addition appeared only on the NordicTrack VR25 of all the bikes we tested. Another factor that made the NordicTrack unique: The smooth ride feel at high intensities. What we would label “high intensity” starts about midway through the resistance level line-up. Even the lowest numbers are on par with the mid-range intensity we experienced on other bikes. Surprisingly, this doesn’t result in unusable highs. The elastic, forward-springing motion of the pedals kept our movements natural even as we were muscling against the top setting. While the consistent resistance quality is luxurious, the bike’s not totally silent. There’s a grumble that provides a detailed mental picture of the flywheel spinning away inside the cover. And it can’t maintain its placid ride quality at lower resistance levels. When reducing intensity or slowing to a stop, you hear and feel a clattering as the flywheel loses momentum. Our one major gripe: The console is set up really high, and there’s no way to adjust it, not even during the assembly stage. Result: The otherwise flawless touchscreen is a little hard to see and a little hard to use. We’re mostly comfortable with the finicky nature of touchscreens (you have to tap at the right angle to get a response) but the extreme perch of the NordicTrack’s screen made using it while seated extra challenging. Challenging enough to take the NordicTrack out of the running entirely? Not at all. But it did have us scouring the manual and manufacturer website for a nonexistent solution. Taller users won’t have any issues, but the farther you are beneath six feet, the more problems you’ll have. Our shorter testers found the VR25’s console to be well above eye level. And once again, the pedal strap design could also use a little tweaking: It has the grooved crank lock you find on rollerblades and snowboard bindings, and requires you to use two hands. One to release the lever and the other to thread the belt. Despite these complaints, the NordicTrack VR25 is a beautiful machine, and the perfect match for someone whose height or size requires extra breathing space. However, we’d advise waiting for NordicTrack’s semi-annual sales before scooping up this top-of-the-line pick — you might be able to save several hundred dollars. More utilitarian in design and feel, this well-priced bike doesn’t skimp on programming or warranty length, plus is easy to transport. The two most reasonably priced recumbents we tested, the Nautilus R616 and the Schwinn 270, are just about interchangeable. Looking at them side-by-side, it’s clear that they came out of the same factory. Both are diminutive, with honeycomb plastic seat backs, elongated, button-filled consoles, and lots of color coding. The one major difference: warranty length. The Nautilus comes with the most impressive warranty of all our recumbent picks — a full five years for parts plus two for labor. That means you won’t have to tinker with any fixes yourself for a good long while. The cheaper Schwinn cuts warranty duration substantially, offering our minimum two years for parts and just 90 days for labor. If you don’t mind rolling up your sleeves for repairs after the first three months, go with the Schwinn and pocket the $100 difference. But we value manufacturer assurance that equipment will remain functional, so with longevity in mind we pegged the Nautilus R616 as the best budget bike. If you’re spending less on your recumbent bikes, you’ll have to make some sacrifices. We found the biggest difference came in adjustability — cheaper models were harder to adjust than their more expensive counterparts. But between our two most affordable bikes, the Nautilus was easier to adjust than the Schwinn 270. The Schwinn gained infamy for sending us plummeting forward when we loosened the seat lever. Nautilus, on the other hand, was guilty of a little harmless rocking. Nautilus’ controls and programming options are presented in a bold, brightly colored arrangement that’s immediately easy to use — scroll through workouts with arrow buttons or select from numbered resistance levels. No guessing required. And you won’t be constrained when it comes to choice — pick from 29 workout programs, just a handful fewer than our luxury favorites. And just because it doesn’t come equipped with technology, doesn’t mean that you can’t bring your own to the table. Media plug-ins and Bluetooth connectivity allow you to blast your own music through the speakers and upload workout stats to your phone. While we found that a low overall weight correlated with a poorer ride feel, there’s a flipside. The Nautilus R616 is super easy to move. Weighing in at 92 pounds, the Nautilus is more than 50 pounds lighter than both the ProForm 740 and the NordicTrack VR25. 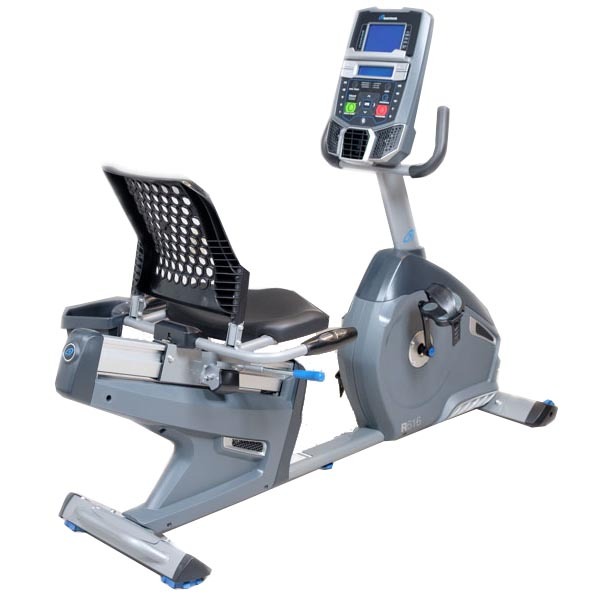 Lightweight bodies plus convenient handles make the Nautilus a great option if you’re looking to wheel your recumbent bike out of sight when you’re done working out.